Who are the grass roots civil opposition? Whilst the main basis of activity is very much at the local level, there are a number of different umbrella groups that have emerged to coordinate and network on the regional and national level. These include the Local Coordination Committees (LCC), National Action Committees (NAC), the Federation of the Coordination Committees of the Syrian Revolution (FCC) and the Syrian Revolution General Commission (SRGC). None represent the totality of local committees/councils and they have different organizational structures and differing levels of engagement or non-engagement with the formal political opposition. For example the Local Coordination Committees comprises 14 local committees. It is a decentralized network of youth activists from different ethnic, social and religious backgrounds that focuses on organizing civil disobedience campaigns and doing media work and also provides humanitarian aid, such as the distribution of food parcels and basic medical equipment for which it relies on individual donations. It is opposed to both local armed resistance and international military intervention. Though non politically aligned, it is one of the few grass-roots opposition groups that participates in the Syrian National Coalition (bourgeois opposition in exile). The LCC’s most recent campaign, following the chemical attack in Ghouta in August 2013, was denouncing chemical weapons use and calling on the United Nations to implement a full investigation and at the weekly protests participants carried signs with those messages on them. In July 2013 they ran a campaign calling on people not to deviate from the original goals of the revolution and condemning the actions of war lords which they said act solely for personal gain and have become as bad as the regime. Students have played a key role in the revolution and have organized protests on campus demanding the downfall of the regime since the first days of the uprising. Political organization on campus (apart from the Baath Party) was banned by the regime, and students that have participated in the uprising have been persecuted by the security forces, with the collaboration of university authorities. Many were arrested and detained. For this reason students began to organize in secret and the Union of Free Syrian Students (UFSS) was formed in September 2011. Their founding statement lists their goals as being; to coordinate amongst students and universities, to organize peaceful demonstrations and strikes, to coordinate with unions, committees and other revolutionary groups and to work on building a civil, democratic and pluralistic state that ensures freedom, justice and equality for all citizens. The UFSS has organized many protests on campuses throughout the country, and especially at Aleppo university. They distribute information and have founded their own magazine called ‘The Voice of the Free’. They document human rights violations carried out against students and campaign for the release of student detainees. They participated in many nationwide campaigns such as the campaign in solidarity with the female prisoners at Adra who went on hunger strike to protest their conditions of detention in July 2013. There are also other revolutionary unions such as the Union of Free Syrian Professors, the Union of Free Syrian Doctors and the Union of Free Syrian Artisans. 30 December until demands (the end of the regime) were met: Ongoing civil disobedience. Nabd (Pulse): Is an organization established to fight both against the regime and against all forms of discrimination including on religious, ethnic or gender grounds, reinforce the diversity of Syrian society and promote peaceful coexistence. 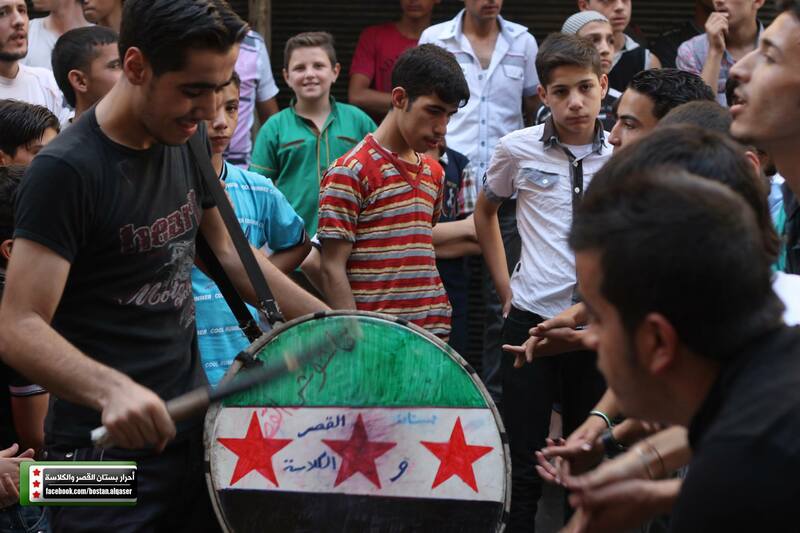 It is one of the largest civil groups in Syria, established in June 2011. Nabd organizes protests which include members of all sects particularly in secular strongholds and mixed communities such as Homs, Yabroud, Salamiyeh and Zabadani. Nabd activists from minority groups such a Alawite and Ismaili communities also smuggle humanitarian aid and supplies into areas under siege. Nabd also reaches out to people that are pro-regime. A recent demonstration they organized was on 23 August in Homs and Salamyah, protesting the chemical attacks in Ghouta. Syria’s grassroots, civil resistance lives on, despite the increased militarization of what is now, not only a revolutionary struggle, but also a brutal conflict between an increasing number of actors. This article has outlined just a few of the many revolutionary initiatives that are currently ongoing. Most of those mentioned above have a nationwide reach, but there are also hundreds of other initiatives happening on the local level as people try to organize both the continuation of revolutionary activity and their lives in areas where the state has collapsed. Undoubtedly such initiatives are the most positive thing to have emerged from the Arab Spring and they have provided hope and energy to a generation which was born and raised under repression. But the civil resistance faces many challenges. It is now fighting on numerous levels; against a tyrannical regime, against militant Jihadi groups, against increasing divisions within Syrian society. As the humanitarian and security situation has worsened, many civil initiatives have had to scale back their work or switched from revolutionary activities to providing humanitarian assistance. Some have had to stop organizing altogether. Most of all these initiatives lack the support and solidarity, from outside Syria, that is needed for them to continue, threatening all hope for a future that is brighter than the present. 4 Syrian Non-Violence Movement, Non Violence Map in Syrian Uprising,http://www.alharak.org/nonviolence_map/en/#Coordinations A few of the committees have a specialized focus such as Free Douma Women Coordination, Souida Student’s Coordination and Homs Doctors Coordination. A small number of committees are outside of the country amongst refugee populations. This map contains links to all coordination/committee website/Facebook pages (mainly in Arabic) This map lists 198 committees, but figures elsewhere from 2012 were around 400. 28 Syrian Non-Violence Movement, Non Violence Map in Syrian Uprising, http://www.alharak.org/nonviolence_map/en/#Newspapers & Magazines The map contains links to all the publications.